Simple steps to solve issues. Ignitions operate on simple principles. Low battery voltage is converted to high voltage using a coil or set of coils. The coil must be turned "on or off" at the proper time to operate the engine. The module must have proper power supply and ground to operate. The coil(s) must have proper power supply, ground, and trigger signal from the module. Over voltage (spikes) are the #1 cause of failure! If your vehicle stops running, you must determine if the issue is electrical or fuel. **Before anything, clean the slots between the reader and ignition module (under the serial number) with Isopropyl Alcohol. Dirt, grease, or other blockage often causes issues. Ground the sparkplugs on the engine and rapidly crank the engine. Observe if spark is present at the ground strap of the plug. NEVER attempt to crank the engine without the spark plugs properly grounded. It can easily damage the coils. Verify battery voltage is at least 10 volts while cranking the engine. If you have a small amp capacity battery that still might not be enough to start it. Carefully use a small jumper pack or similar size battery to help start it. NEVER use a plug in booster device or battery charger with the key turned on. You can easily destroy electronics! Verify the ignition LED is blinking when the engine is turning over (rotating). It takes at least 50 rpm of rotation to produce spark. If there is no light, run the red module power lead directly to the battery, and connect the module ground directly to the battery (the new CD ignitions have a black ground wire, but older C series you will need to connect a wire from the mounting screw to the battery to supply a solid ground path). If there is still no module light contact us. On coils that have a ground wire (black) and trigger (yellow) take the black ground wire directly to the battery (-) terminal. On coils that only have a black trigger wire, verify that is is firmly connected to the ignition module wire. If you still do not have spark contact us. Testing coils is easy. Disconnect the trigger lead from the module. Now QUICKLY drag the coil trigger wire across a good ground(the battery is best) and see if it produces spark. Of course, the spark plug must be firmly grounded to the engine to perform this test. If you get spark.. the coil is working as it should. Test the module by disconnecting from the coil and install a small test light (LED works best). Crank the engine quickly and see if the light flickers. If it does, the module is working as it should. 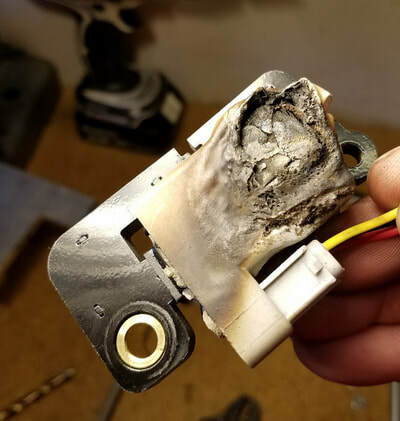 ​We get calls about issues regarding no spark or intermittent spark. In 99% of the cases, we end up finding a problem on the vehicle side of things. If you are not an expert with electricity, please have someone help you so that parts are not damaged. Avoid routing or securing any ignition or coil wiring to the alternator output wires or spark plug wires! This can allow dangerous high voltage EMI spikes to affect timing and damage or failure could occur. Wrap the ignition wires in a manner that avoids cross feed. If you are using a handlebar emergency switch or a pulling tractor with safety kill switch use a quality device that locks in place. Avoid using cheap or loose connections that can cause electronic failures. It is difficult to detect voltage spikes because they often occur in short bursts that a voltage meter cannot detect. We see most failures on farm tractors and "non Japanese" motorcycles. I believe this is because of poor quality original parts, low grade Chinese replacements, or vintage original parts that are beginning to fail. After installing new regulators or DC converters the problem typically goes away. 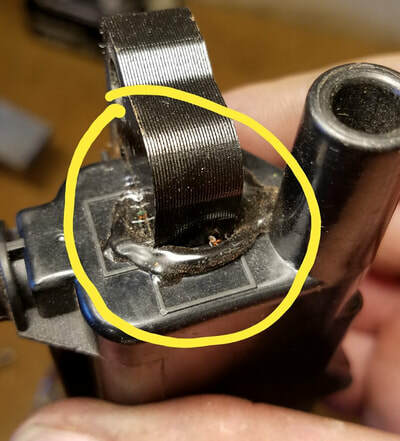 You can purchase replacement coils at a one time discount if you have a failure. 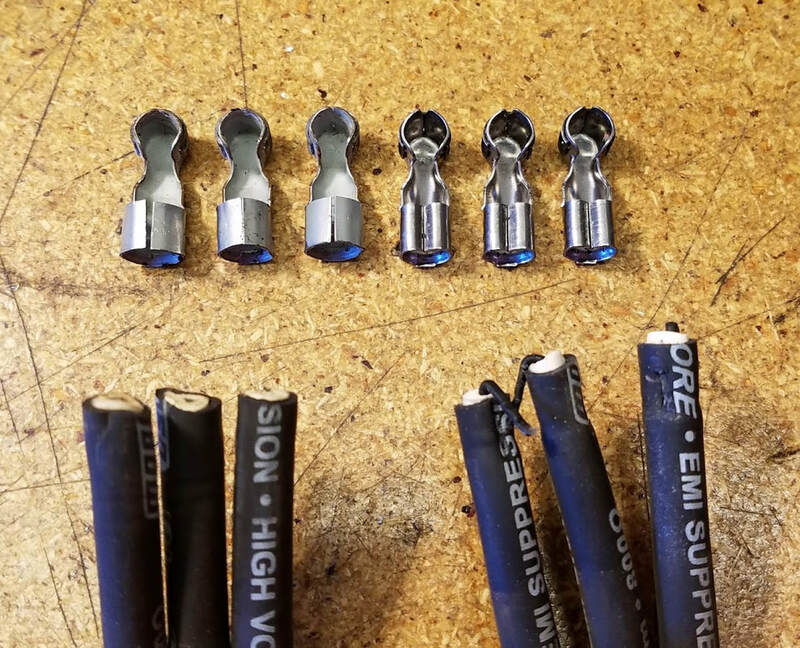 Using anti-seize on plug threads? When shortening or making a set of spark plug wires, there are certain things that need to be done correctly. You also need the proper tool if you are crimping on terminals. Here is a photo gallery showing the proper method. If you aren't sure what to do, please bring to a certified repair facility to avoid issues. Burned or over heated components are not covered by warranty and are preventable! Use silicone to lubricate the boots when installing them. It helps the cable slide and prevents damage. Some terminals require the boot to slide over the wire BEFORE the terminal is crimped in place. The wires on the left were improperly crimped and the internal wire had not been stripped back and folded over. The result was the wires burned as the coil tried to jump the gap. The coils eventually over heated and melted. The wires on the right were correctly stripped back and crimped (factory Moroso crimp shown). This is the correct method. Signs of heat related failures are a direct result of voltage spikes or "over voltage"
Fuel mixture, ignition timing, fuel burn rate, load, and the number of spark events are all related. If any of these items are changed, it affects engine operation. 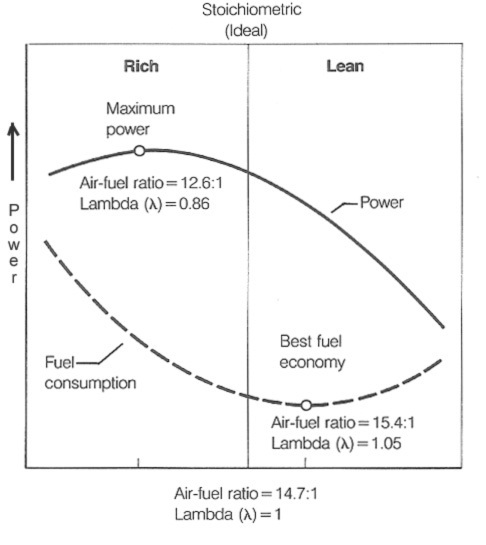 Fuel Mixture - Air–fuel ratio (AFR) is the mass ratio of air to fuel present in a combustion process. 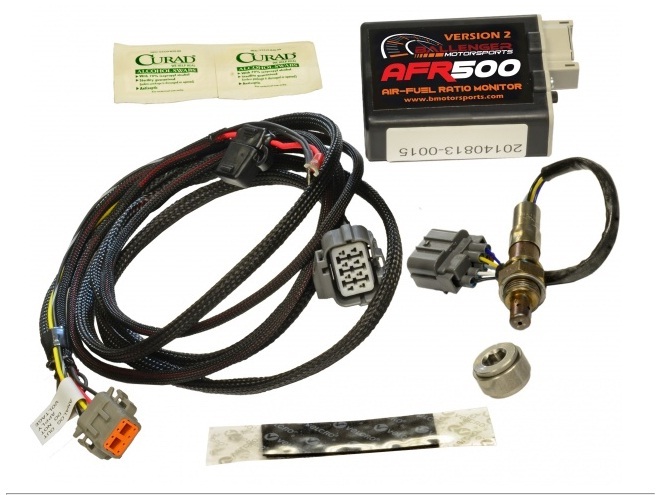 The AFR is an important measure for efficiency and performance-tuning. We have found a Lambda mixture of .85-.90 is a great starting point when using our ignition. Most tractors that we have measured are too lean. This doesn't seem to bother stock ignitions except you lose power. It can cause popping in the exhaust with the C5. Keep reading to find out why. When we first began running tractors under heavy load, we had a few engines buck, hiccup, hesitate, or pop loudly out the exhaust. On a naturally aspirated engine fuel burns best when AF ratio is between 12.6 and 15.4 ball park, right? When there is a higher or lower ratio of air the flame is more difficult to stay lit. Large carbs or manifolds also cause issues when velocity is sacrificed for volume. Any unburned fuel exits the combustion chamber and some of that fuel pools in "dead zones" of the exhaust manifold. Our ignition is a wasted spark coil pack system so it sparks three times on compression and exhaust cycles. The sparks that occur when the exhaust valve is open may ignite this fuel causing a disruption of air flow and creates the audible popping. 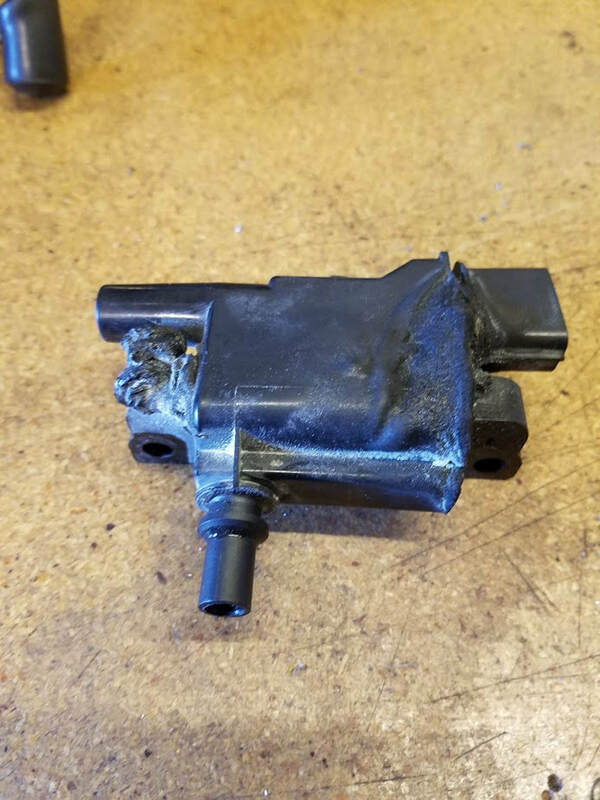 This is also common in high performance cars and some motorcycles. Why don't motorcycles do this as much? Tractor manifolds generally exit upward, where unburned fuel can be trapped. Also motorcycles are never run under the heavy load that a pulling tractor sees. The popping noise usually shows up under heavy pulling or dyno runs when the engine/manifold are hottest. *****************************************************************Luckily this is a wonderful opportunity! In our quest to resolve this issue, we stumbled upon the AF meter and the power of accurate measurement. You can't fix what you don't measure. We found every tractor that pops was very lean at that particular rpm. Once we adjusted the carb to the correct AF ratio, the popping went away. On some engines we also discovered fuel delivery issues (restrictions in the venting, fuel supply, filters, or needle/seat size). Once we opened up the fuel system to allow the carb to be correctly adjusted, the noise went away and we found performance had increased.